Selle Francais horses comes from France, where they are popular as a racing horse and have an incredible ability for high jumping. One in particular, the Selle Francais Baloubet De Rouet, was the winner of three World Show Jumping Championships. Over time they have been cross-bred Norfolk Trotters and English Thoroughbreds. Anglo Norman horses and French Trotters were the result of all some of the breeding. Over time various styles of the Selle Francais horse have been developed for drafting and also for riding. A specific horse named Orange Peel was placed into the blood lines to increase the riding abilities. Selle Francais orses are full of energy and extremely smart. They are also considered to perform at a rapid pace and are commonly utilized for horse competitions and racing as they truly can excel in these areas. They can be found in London. St. Lo, along the Bay of Biscay and English Channel as well. Still categorized as a newer breed, they are growing in popularity everyday. As many centuries passed, the strict procedures on testing and making the Selle Francais horse breed even better has improved greatly. As horse racing began to expand in England, it put an emphasis on the Selle Francais and how experienced they were as opposed to other horse types at that time. 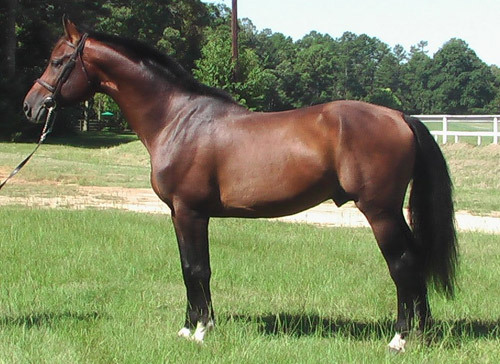 Breeders went on to create many stud farms all over the world based solely on this particular breed. Selle Francais horses are tall (around 17 hands) and beautiful. They have been bred in all sorts of colors, but they are most commonly found in solid shades versus spotted ones. They have a long neck and an elegant appearance along with strong legs and a deep chest.